Once upon a time the first people’s hero of Yugoslavia. Of people and nations now former, at least on paper. Which should be written, on the following pages, never revised. Once upon a time Rade Končar, the partisan Rade, the young Končar. The man who, after spending adolescence and dreams in the name of an ideal of freedom and rights for all, became a symbol, a chapter of history and, therefore, a statue. To eternal and solemn admonition of the heirs of such a duty against the nostalgia of legalized hatred. A commitment which should not retreat even a single centimeter, let alone lowering head and guard. A fool, perhaps, a sign, maybe. Further proof of the urgency of resistance to the bitter end. A wretch soul who followed his own delirium and kicked the noble testimony of the dark past. 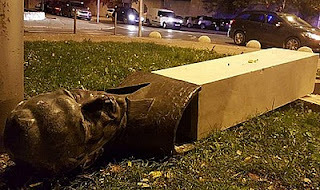 Well, according to the last news from Split the statue itself fought back and collapsed on the guy, breaking his leg. Because memory, when it wants to, can defend itself.